I’m particularly proud of this creation, a squash soup made with one of our giant heirloom ‘Oregon Homestead Sweetmeat’ squashes, onions and leeks, and celery leaves. I was seeking a way to make pumpkin soup without the sweet flavors that always dominate. I wanted a hint of sweetness and more body than just fiber. That usually means UMAMI, the battle cry of the meat eater. Umami is, as we’re probably all well aware by now, the “meaty” fifth taste, alongside its frat brothers, sweet, salty, bitter, and sour. Think mushrooms, nuts, soy sauce, cheese. Sauteed onions, too, add some umami to a dish. 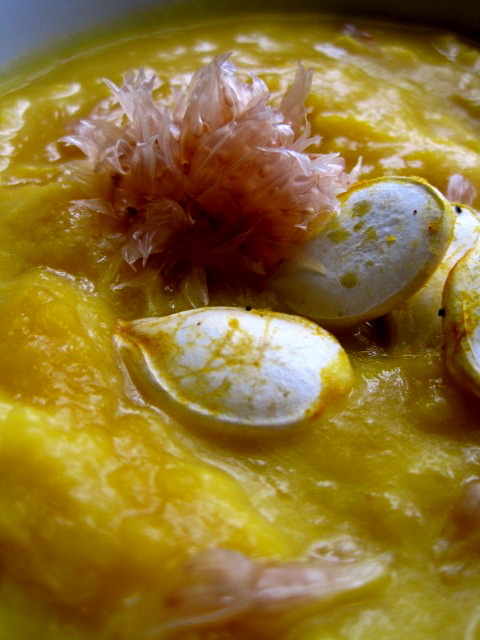 The garnishes keep the soup fascinating, another risk one runs with monotone squash soup. I roasted the squash seeds after only a quick rinse to retain some of the squash fibers clinging to the seeds for more flavor. Topped with black pepper, truffle salt, and a bit of argan oil, they were gilded like gilded lilies. 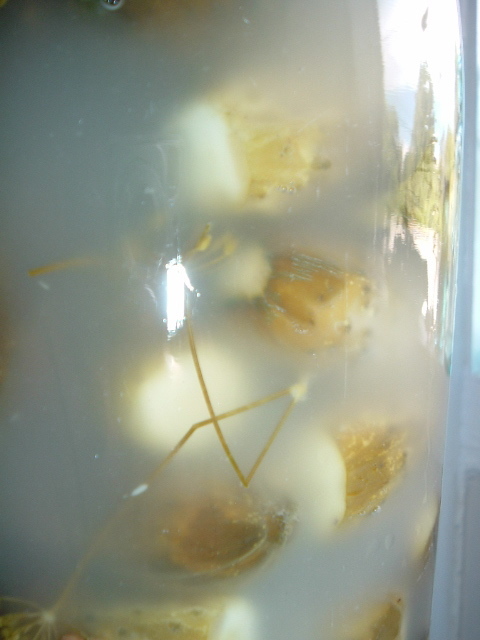 But even better, I broke apart pickled chive blossoms and floated them on top of the bowl of soup. 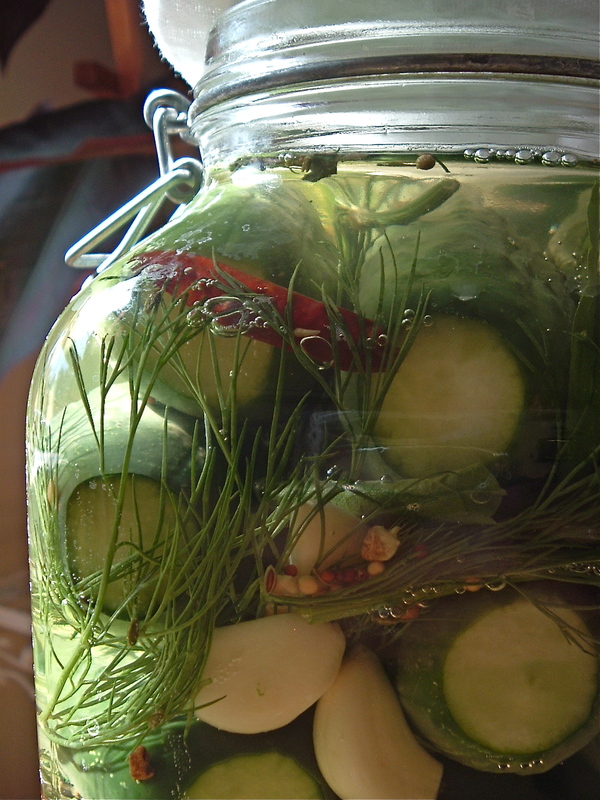 I urge you, gardeners, to make chive blossom vinegar this spring. It’s a wonderful dressing, colored rose pink, and you can use the pickled blossoms in all kinds of ways. 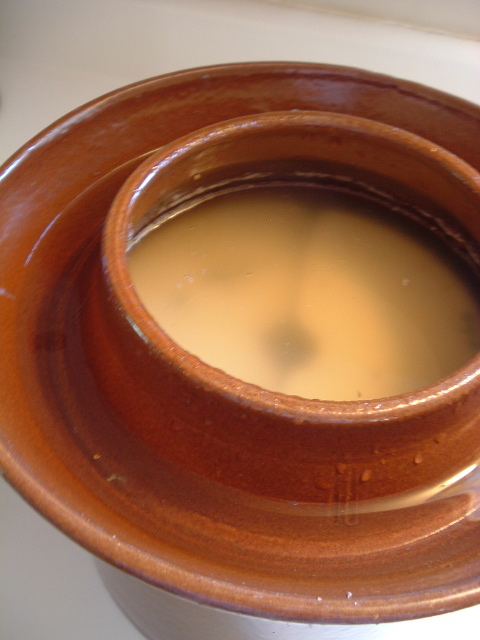 Here, it provides the sour balance to the sweet, salty, bitter (from the celery leaves), umami soup. Don’t omit the celery. It provides an important taste component (see above), and the soup really needs the mirepoix of onion-leek-rutabaga-celery to add complexities to the flavor. I’ve been using Marisa at Food in Jars‘ suggestion to take soups to work in mason jars. I’m a bit leery of using my canning jars for daily eating, since they tend to break more easily when they’re redeployed in canning after being banged about, but portable soup is such a messy proposition, I recommend the nice, tight seal canning lids can provide. Here’s my basic recipe. The delight of soups is that you add as you go, so I don’t have measurements for this one. Cut the squash in 1-inch cubes and dice the other vegetables. Add all vegetables to a stock pot with the butter/bacon fat and some salt and pepper, and sweat on medium low heat with the lid on until everything softens up, about 20 minutes. Add stock and herbs, and mash the vegetables. Bring to a simmer, then let cook down for 45 minutes or more on medium low heat. Puree the soup with a hand blender, then add the half-and-half. Mix well. Let flavors combine and liquids cook down even more, about 30 more minutes, on low heat. Adjust seasonings and garnish before serving with pumpkin seeds, sunflower seeds, chives, or other herbs. Another option is to roast the squash first, in large chunks, at 325 degrees for about an hour, then scoop the flesh off for the soup. It adds more flavor. 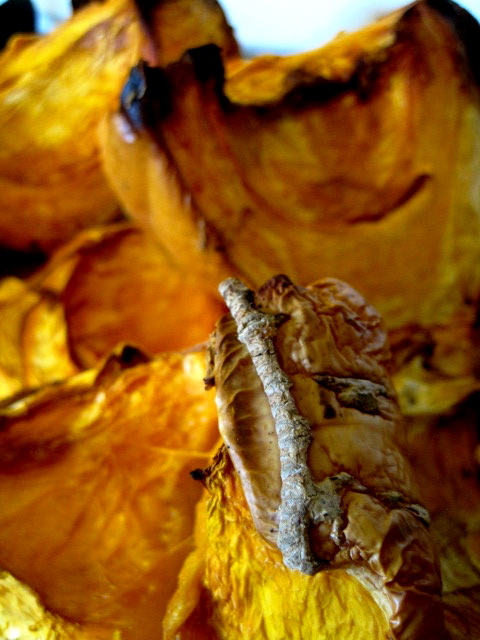 Plus, you can roast the squash seeds at the same time. 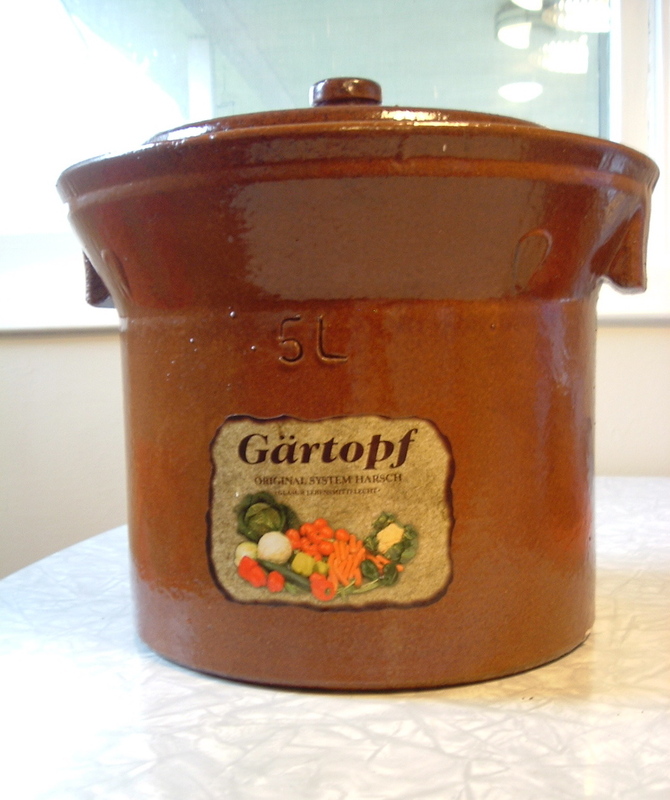 * I have the luxury of having a tub of wonderful bacon grease from local pigs, so it adds loads of flavor to my soups and pot roasts. You might consider browning some pancetta, minced, in oil and using that for the fat. 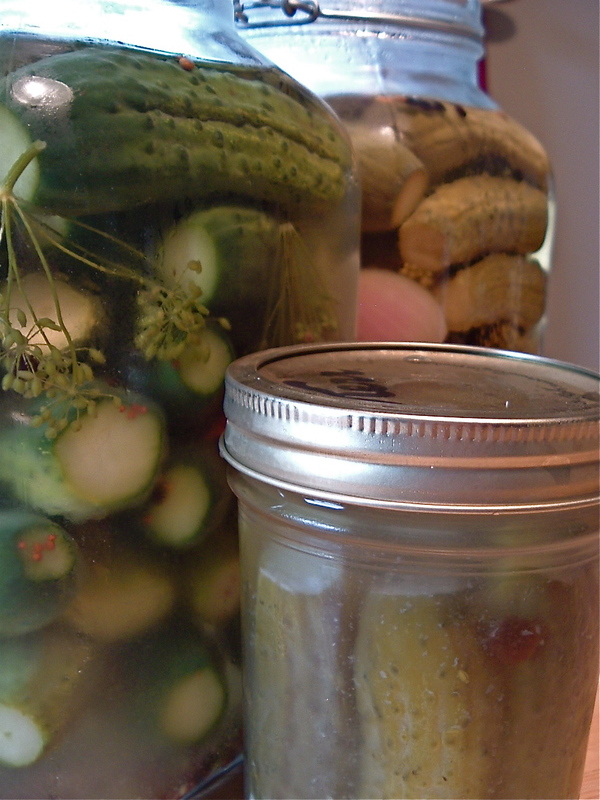 I often cringe when I see pickling recipes on the internet, but canned tomato recipes are usually downright unsafe. I’m not a complete preservation safety cop, but there are some basic rules I really do follow. I carefully consider the surfaces that encourage microbial growth. I’m kind of a cleaning maniac when I’m canning — I really do scrub up everything and sanitize my sponges before canning. And I make those little suckers feel very uncomfortable by changing their happy low-acid free love festival to a high-acid paranoid police state. Kills the ambiance, you know? I pay more attention to acid than a Berkeley undergrad. Tomato preparations need added acid because they’re right on the cusp of what we call high and low acid foods on the pH scale. My guess is that those watery plum tomatoes we buy by the lug are on the low end. Low-acid foods are breeding grounds for pathogens, including the dreaded clostridium botulinum. We want to make anything we can either high in acid or high in sugar, sometimes both. using vinegar. DO NOT substitute vinegar for lemon juice. Lemon juice is more acidic. Use only bottled lemon and lime juice in tomato canning recipes. I know, bottled lime is not the best taste and often contains preservatives, but you won’t be able to taste the bottled-ness in your tomatoes, and the preservatives actually may help. The problem is that the acidity of lemons and limes varies over the season, and you want consistency in canning tomatoes, especially if you are using a tested recipe…or if you aren’t using one, you’ll need all the acidity you can get. I save my fresh lemons for high-acid fruit jams, where you can really taste the difference. The percentage of acetic acid in vinegar is almost always printed on the bottle, so check it out, and don’t use anything under 5%. If you follow these two basic rules, you’re on your way to canned tomato nirvana. Turn on, tune in, and drop out, man. I made it back to Buffalo, shuffling. Hope that doesn’t mean a delivery of a racially stereotyped baby to my door. A Catskills-style song and dance routine with elves would be nice, though. The long flight was made bearable by bearable Southern food in ATL. With all my complaints about greens, I have to confess that I could sit around and eat Southern-style collards all day long, every day. The ones I make at home, long simmered with ham hock and dressed with a knob of butter and vinegar, are never as good as the ones I’ve had made by bona fide Southerners. The reason is clear: I don’t have even a hint of the South in me. Even my ancestors are northerly. I even felt helplessly trapped under the Mason-Dixon line when we lived in Baltimore; that’s how North I am. So, eating at the undoubtedly mediocre buffet at Pascal’s in the Atlanta airport, I was in heaven to tuck into a huge pile of collards, the star of a plate containing mushy long-cooked green beans (yes, another vice of mine), and what I thought would be a smothered pork chop but what turned out to be a Salisbury steak. It was the best TV dinner I had ever had. I followed it with a praline chaser from what is most likely a famous Georgian candy shop, whose name I can’t recall but had something to do with Savannah. Among all of these delicious delights, the star was a simple preparation of tabasco peppers steeped in vinegar, available as a condiment for the greens. I was too stumped by the moniker “green pepper sauce” when I examined the clear liquid, so I didn’t catch the brand name. My friends tell me there are many different possibilities; the internet agrees. I know it wasn’t Texas Pete’s. The bottles were small and glass, the size of a Tabasco bottle. What, WHAT, was the name of that delicious sauce? 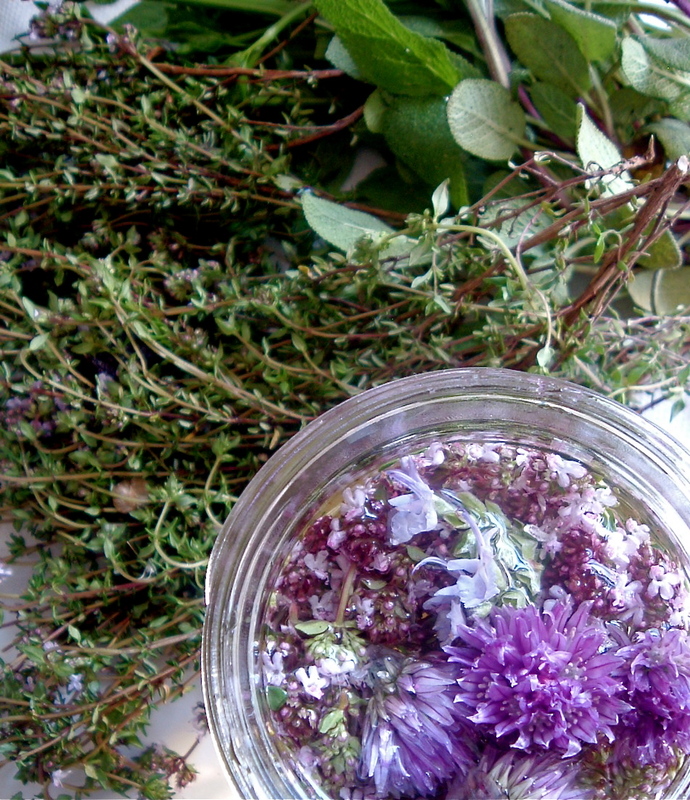 Make your herb flower vinegar now, or forever hold your peace. (Well, at least until next spring.) Don’t waste the herb trimmings you’ve pruned from now-flowering plantings. My vinegar is fortified with thyme flowers, Tuscan rosemary flowers, chive blossom heads, and a single strawberry blossom. Another lovely possibility is chive blossoms and a long, fat twist of lemon peel. 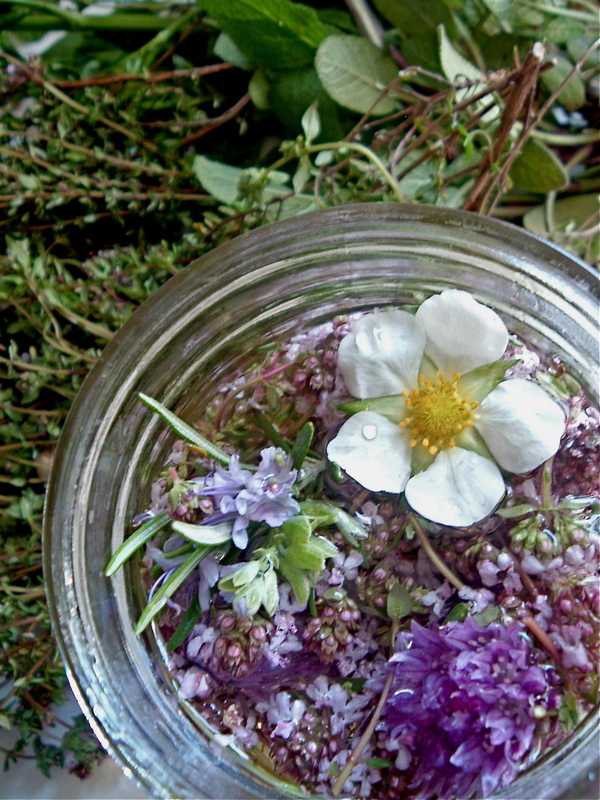 Pack the flowers loosely in a jar, then fill with a decent quality vinegar. 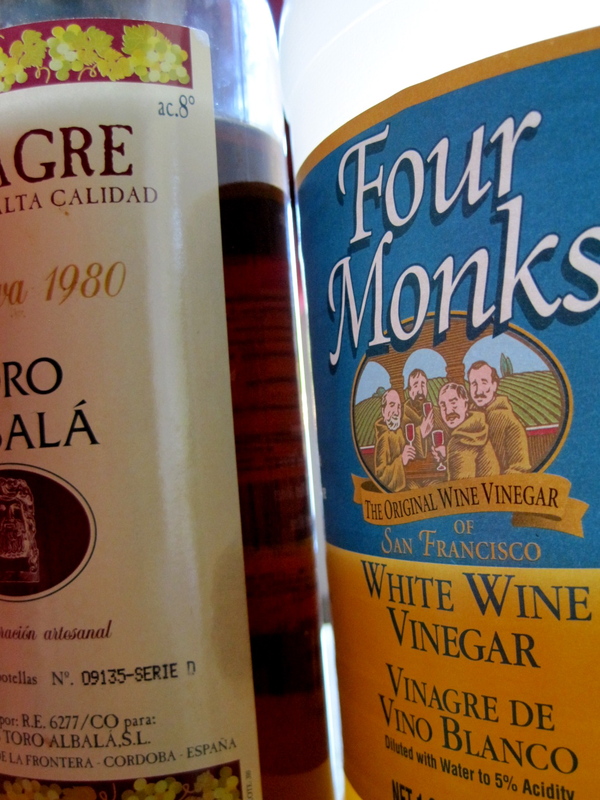 I prefer wine vinegar over plain distilled vinegar, since the latter is so sharp-tasting, but you could use either. Top with a non-metal cap and let sit for a month or so before using or gifting.